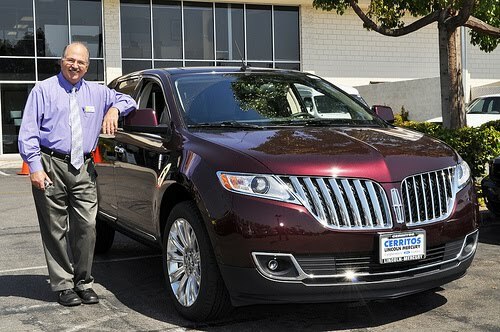 As many of you know, The California Lincoln Dealers handed Actress/Model Vane Millon and I a 2011 Lincoln MKX, tasking us with the challenge of generating some local buzz and interest in their amazing new luxury cross-over SUV. I'm the "Product Specialist", she's the beautiful and sophisticated (but very approachable) model. Pretty straight forward. To get things started, I got trained up by a local California Lincoln Dealer, Vane did some video shout-outs to local businesses on her Best of California Group page, and the California Lincoln dealers helped spread the word by setting up their own pages: Facebook, Youtube and Twitter. Within just a few weeks, local California businesses started chatting it up and reaching out to us! For more info on how it all got started, click here. If you'd like to be a part of the fun, tweet me. The first leg of of the trip last week was an absolute whirlwind. Sacramento, San Francisco and Monterey in just four days. Did you see some of our posts and tweets? For those of you who missed them, you can check 'em out here. Vane even got a chance to do her first MKX walk-around in San Francisco! We shot so much incredible footage it's going to be tough to decide what to edit out. And trust me, there were major suprises, too. Here's a quick snippet of our time in Sacramento. You can find a ton more pics and even some videos on Vane's group page, as well. As for San Francisco, it was just as wild. Went by in an absolute blur. Here's just a few out-takes and snippets from behind the scenes in San Francisco. Like I said, we had some surprises there, too. But then again, when does a road trip ever go exactly like planned? Then it was on to Monterey, where by now, we were grateful for some R&R in one of the most beautiful spots in all of California. The camera crew, a little slap-happy, also took a quick time-out to show how NOT to activate the MKX's Blind Spot Information System (that's the little orange light that illuminates on your side mirror when there's a car in your blindspot.) Here's how it really works. :) Below is how our camera men tried to activate it. Wanna be a part of it? Think you've got a Best of Cali Business or Destination? If you're interested in us highlighting your business, drop us a line on our Facebook page, or you can Tweet me or Tweet Vane, as we've still got room for someone who thinks they've got a "Best of Cali" business! Either way, make sure you don't miss all the updates by "liking" our Facebook page, Vane's Best of Cali Group Page, Lincoln's Youtube Channel or even Lincoln's Twitter Account!